You are here: Home > Ventilation Ducting: Some FAQs! With the growth of whole house ventilation systems, ducting product and systems abound and specifying and installing them has become considerably more complex. David Treharne, Senior Engineer at Domus Ventilation, answers the most commonly asked questions when it comes to domestic ventilation ducting. What types of ducting are available for domestic ventilation systems? There are four types of plastic ventilation ducting systems to choose from: the original flat channel which is effective and space saving; the round pipe, which offers improved flow rates but can be problematic where space is at a premium; the low cost flexible hose; and the latest addition – the radial. Radial ducting is specifically designed for use with continuous mechanical ventilation systems. Unlike traditional branch style ducting, Radial uses 75mm semi rigid duct to connect directly from each room vent to a central distribution system, negating the need for various duct bends and connectors. 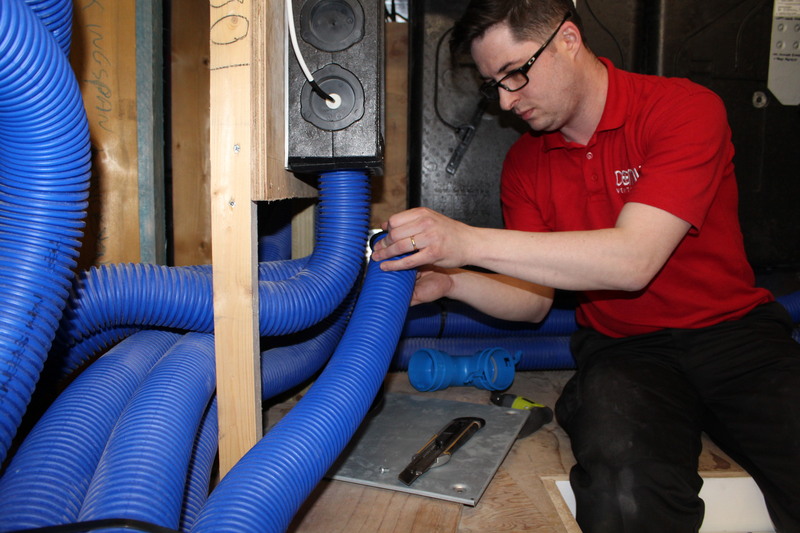 This system benefits from less air leakage and improved air flow, which also makes for easier commissioning and a quieter system, as well as it being quicker to install than traditional branch ducting. The other ducting systems come in a variety of sizes and can be used for whole house ventilation or just for bespoke ventilation in the kitchen and bathroom. How do I decide which ducting is most suitable? Which duct type you use may vary according to the ventilation system specified and further dictated by the installation requirements. For example, best practice, in accordance with the latest Building Regulations, states differing uses of the low-cost flexible hose depending on if you are installing singular Axial fans or an MVHR system. Nevertheless, flexible duct should always be pulled taught to ensure that the full internal diameter is obtained and flow resistance minimised. Whatever type you do opt for, one thing that is universal is that you choose good quality ducting. Substandard ducting could result in the ventilation system not meeting Building Regulations through to a room with an ugly stain in need of redecoration as a result of leakage from the ducting system. How do I identify good ducting from bad? Sadly, there’s no standard to look for to help differentiate a product or range. Ducting that has been designed to work in harmony as part of a system and has been third party tested for end-to-end system performance is a very good starting point though. Such rigorous testing guarantees the system will meet the required level of extract performance dictated by Building Regulations (Approved Document F). Exacting tolerances, i.e. the fit of rigid extruded systems, is a sure indicator of quality. If the channel or pipe bows or looks like it is concave or the wall thickness appears uneven the tolerances will be too wide. This is a problem because these systems are designed to push fit. If they don’t retain their shape, they can be difficult to fit together but more importantly they result in air loss which reduces the system efficiency and increases the risk of moisture leakage around the connections which can cause staining and damage to surfaces below. Are ducting accessories important or are they just there to make money for the manufacturer? It’s important to consider not just the straight ducting available but also all of the accessories that you need to create the ventilation system as a whole. This includes moulded fittings and a range of bends from 90º-45º. The award winning Domus Greenline 90° bends provide up to 60% reduction in resistance to air flow, significantly lowering a duct system’s total pressure loss and therefore overall energy usage. Having a wide range allows for a variety of solutions to individual problems. It gives you the ability to specify the ducting system in the most economic and aerodynamically efficient manner if, for whatever reason, you cannot meet the designed layout due to unforeseen site circumstances. Can I mix different manufacturer’s ducting in one system if it’s the same size? A mix and match approach to ventilation ducting is never a good idea. If you use ducts from one manufacturer and then accessories from another because the first one doesn’t have the parts you need, your system may be less effective and problems will occur. Instead, use a single source for your ducting from a complete system provider as you are then guaranteed compatibility and quality of fit and, ultimately, good air flow. How do I make my ventilation system quiet? A noisy ventilation system is more often than not a result of ducting that is too small for the volume of air extracted, or poorly installed. This creates excess noise and added strain on the motor and reduces life expectancy of the fan. Where the ducting isn’t the cause of sound, it can be the carrier of it. Sound can travel down the ducting from the fan, or from traffic noise or room-to-room-cross talk. Duct sound attenuators can be used, which effectively absorb sound over a range of audible frequencies. What type of ducting insulation should I use? Ducting insulation is required to meet Building Regulation requirements as outlined in the Government’s 2010 Domestic Ventilation Compliance Guide. The Guide states that ducting must be insulated where it passes through unheated areas and voids, such as loft spaces, to reduce the possibility of condensation forming, which can lead to unsightly – and unhealthy – mould. The Guide sets a minimum duct insulation standard which is the equivalent of at least 25mm of a material having a thermal conductivity of ≤0.04W/(m.K). Domestic duct insulation products on the market are often unable to meet this requirement; our own Domus Thermal exceeds it and therefore allows ventilation installers to fully comply with Part F 2010 Building Regulations. Can you explain what fire safety precautions I need to take? Need any other expert advice? Contact our team here.